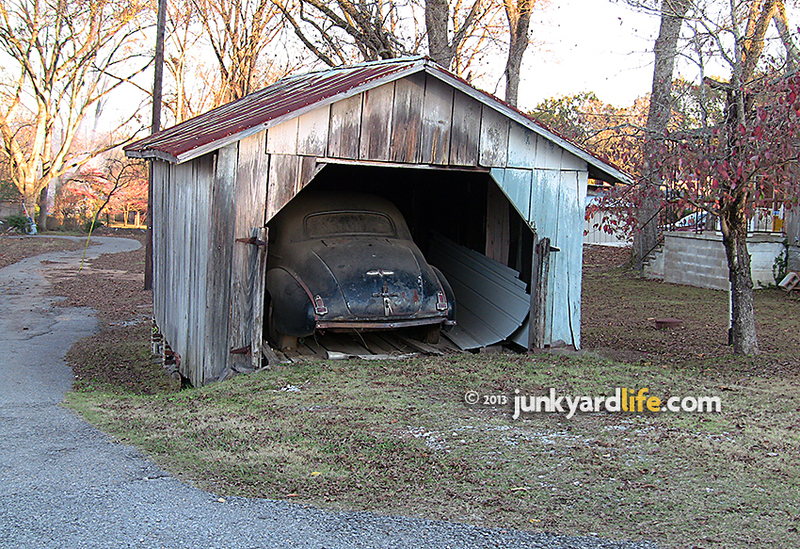 We all dream of finding an antique or classic car stashed away in an old barn. I found this 1941 Buick sitting in a garage in a small town in rural Alabama. Does this qualify as a barn find? What is a Barn Find? I think we all dream of finding that ultra rare muscle car that has been safely tucked away inside an old barn, where it sat safe for years from the elements and from prying eyes. We’ve all heard of the old Corvette found after years of storage in a dry, dusty barn in rural America. It is such a popular urban legend that the term “Barn Find” was coined to describe such a car. But does a car really need to be stored in a barn to be classified as a so-called “Barn Find”? And how long should it have sat before being discovered in order to be considered it a true barn find? Obviously, it’s not a real one if it was just recently placed inside that old barn. To many, the ultimate discovery must be found in a dusty old wood barn with a dirt floor. To others, any form of covering such as a shed, carport, or even old garage meets the definition. The one common denominator appears to be time. A car must have been stored for a long period of time and be relatively unmolested. Some enthusiasts treasure the years of dust attached to their barn find, taking special care not to disturb the dirt and grime as they load it up for the trip home. I searched the web looking for the definition of a barn find and I found very little, other than the fact that not all barn finds were actually found inside barns. 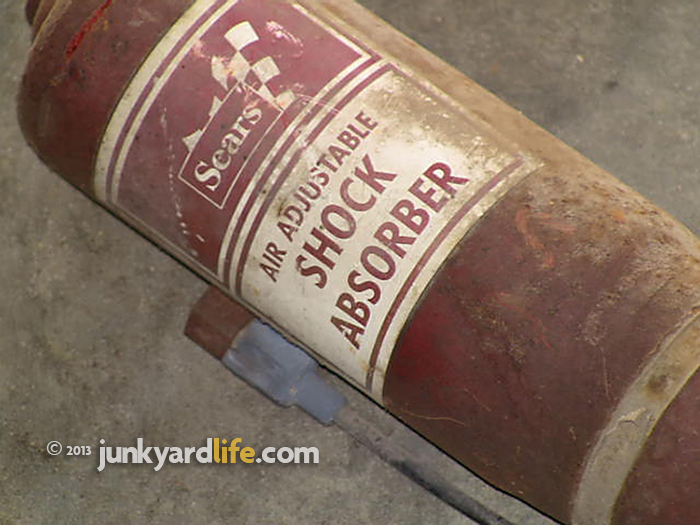 Some were found inside backyard garages, sheds, under carports, and even inside old warehouses. The most coveted barn finds were found still sporting their original wares, while some were found with minor upgrades. There is even a series of books call “Lost Hot Rods”, where older hot rods of historical significance were sought out and eventually found in much the same manner as a traditional barn find. So obviously the definition of a barn find varies from person to person. No matter what definition we use, I believe many of those classic cars that were actually stored inside backyard garages, sheds and dilapidated old barns, have already been discovered, or worse, those structures which provided protection for so many years have begun to fall down on top of them, in fact, facilitating their demise. There are no more real barn finds! Or are there? 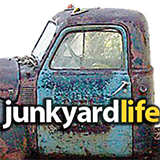 It depends upon your own personal definition of what a real barn find is. As I drive the back roads of rural Alabama, I am still finding old cars stored under carports and in old garages, barely visible from the street. Cars like the 1941 Buick in the top photo are waiting for their time to be discovered and brought back out into the light of day. At first glance the Oldsmobile 442 didn’t really look neglected. But upon closer inspection, it became very apparent that she had been sitting for quite some time before the previous owner finally decided it was time to let her go to a new home. The only thing missing was twenty years of dirt. 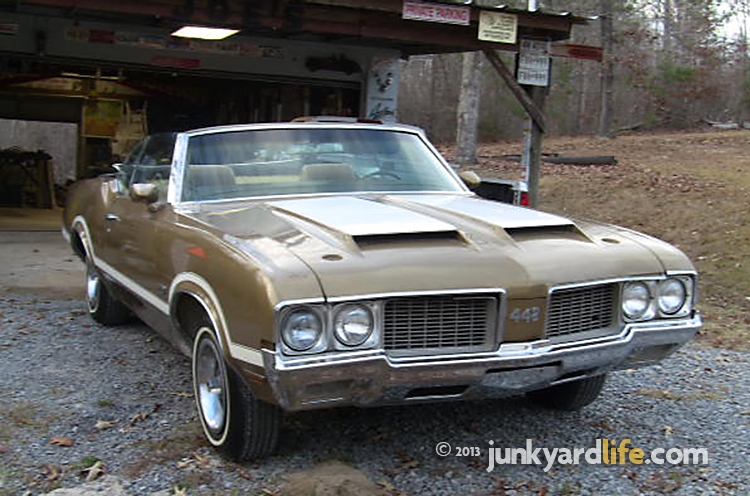 In November of 2012, I got a lead on an original 1970 Oldsmobile 442 convertible. I wasn’t really thinking barn find as I made the short drive to Hayden, Alabama. Nor was I thinking I had found an ultra rare car. To me it was just a Cutlass convertible with an aftermarket 442 hood. But as I drove through the rural countryside, taking in the scenery as I turned from one county road to another, I began to realize that this may be as close to a barn find as I might ever get, even if it is just another Cutlass. I hadn’t seen a subdivision in over forty minutes and everywhere I looked, I saw either barns or sheds. This was Alabama farm country, a rolling mix of pasture land broken up by large expanses of woodlands. As I left home, this was still just another classic car advertised by an owner who had either grown bored of it, was in need of money, or both. But as I got closer to my destination, I began to think of something more. I began to think of what actually constitutes a barn find. I had spoken to the owner’s son, Joe, over the phone. Joe was selling the car for his father, who had owned the 442 for a little over 25 years. He had given me pretty good instructions on how to find his house, and he had assured me it would be fairly easy to find. And just for a little extra insurance, I had printed up directions from Google Maps. But finding Joe’s home proved to be much more difficult than I had anticipated. He lived on an old one lane gravel road, far off the beaten path. Finding this small gravel road was difficult enough, but finding the hidden driveway that led up to the old farm house was next to impossible. I eventually had to call Joe and ask him to come out to the main road in order to guide me in. As I followed his old Ford truck down a long and winding driveway, I saw the old structure that housed the car I had come to see. It resembled an oversized shed or small barn, something that was originally intended to store a farm tractor and a few other farm implements. Joe’s dad had converted it to a garage, which now housed four cars in the front section and misc yard tools, as well as old car parts in the rear section. From the inside it now resembled an oversized garage, cement flooring and all. Along with the 442, there were a few other vehicles sitting beside it. These other, newer vehicles had taken the place of the old 442 years ago. Leaving the 442 to sit and languish, eventually becoming a home for a few field mice that lived in the barn as well. Fortunately, the 442 was somewhat functional. So pulling it out of the barn/garage/shed wasn’t an issue. To me the car looked to be original. But I am an amateur in the world of car collecting. The paint appeared to be original, as did the interior, and both were still very presentable, even though they were showing their age. It was only after talking to a very honest seller that I learned that the car had been repainted. He also explained most all of the other deficiencies found by the many Oldsmobile experts who had viewed the car before me. The hood was an original 442 hood, but this car didn’t leave the factory with a Ram Air hood. 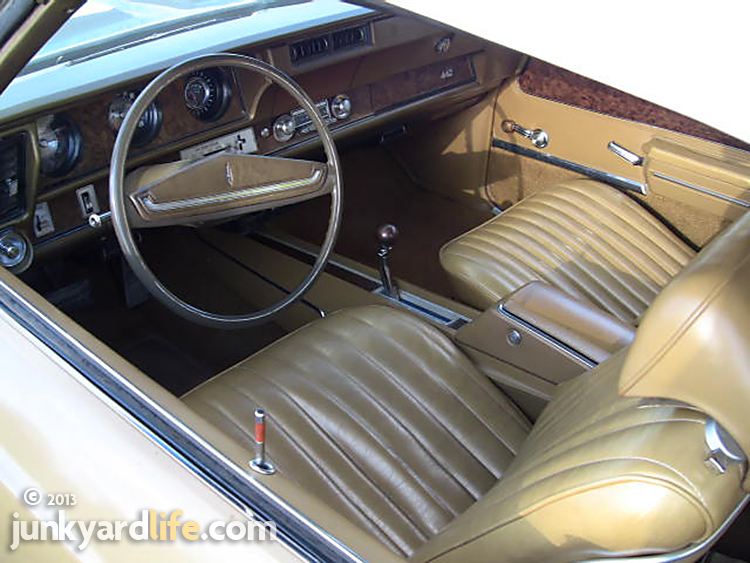 The seats had been reupholstered in a tuck and roll pattern and one of the fenders was also not original. The non-original fender was from a 1971 or 1972 Cutlass. The difference between a 1970 fender and a later model fender is so minor as to be missed by a novice, such as me. It can only be noticed by lifting the hood and looking for some relatively small indention where the hood meets the fender. The 1970 fender is flat and smooth where the hood rest when closed, where as the 71/72 model fender have a ripple every six to seven inches which allow the fender to crumple on impact and absorb the shock of a collision. The biggest issue seen was the non-original motor now sitting in the engine bay. The previous owner had for some unknown reason, pulled the original 455ci motor and replaced it with an Oldsmobile Rocket 350ci. I think this was the main reason why the car had not yet been sold. Well, that along with the relatively high price tag. Being unfamiliar with these cars, I did some online research before arriving. So I had a good idea of what to look for. The most important thing to look for when looking at a 442 is the digits 344 in the first three digits of the VIN. Other things to look for are a 455ci motor, crudely boxed-in trailing arms, bucket seats and a center console. This car was correct in every way except it was missing the original 455ci motor, which apparently is a big deal. During my research, I also learned there were only 2,933 442s built in 1970. So they are relatively rare. And they are also very highly sought after for their styling and performance. To many, this isn’t the preferred color combination for a classic 442, but to me, it say’s 1970’s like no other color can. Considering the fact that none of the experts who came before me actually bought this car, I should have probably walked away from this deal. I am sure they knew more about the actual value of this particular example and they had good reason not buy it. But I really liked the car. I have always wanted a Cutlass convertible, ever since first seeing one when I was in high school. And this was a 442 convertible, which in my mind, is a really cool Cutlass. There is more to my affection for the Cutlass. My grandmother had several throughout the years; one of which was a 1970 Cutlass Supreme Holiday Coupe. I can still remember riding along with my grandmother, sitting in the front seat, looking out at the passing countryside as we drove from the farm into town to buy groceries, or to do whatever else she needed to get done. Later, when I was in high school I brought home a 70 Cutlass to show my parents. It was my intent to trade my Chevy Vega for the Cutlass. Something my parents refused to let me do. I guess they realized it may have been just a little too fast for a sixteen year old to own. So, as you can see, I may have been a little emotionally involved when I was buying this 442. I spent the better part of an hour talking with the seller before actually mentioning an offer. I walked around the 442 as we talked, looking underneath the hood, crawling underneath the car in order to better judge the floor pans, trying to find a reason not to buy the car. As hard as I looked, I couldn’t find anything. Or at least anything that really scared me. The floors were in great condition. The car was solid, with only a few bubbles around the rear wheel wells and lower front fenders. There was nothing that said this car couldn’t be easily restored. So after considering the work needed to get the car back on the road again, the value of the car once restored, and my own financial capabilities, I made what I thought was a low but fair offer. After a few minutes of silence, Joe reached out and shook my hand, closing the deal. Much to my surprise, my offer was accepted. The car was now mine. And at that moment it dawned on me. I hadn’t test drove the car. The data plate confirms this car is not a Cutlass, but rather a 442. 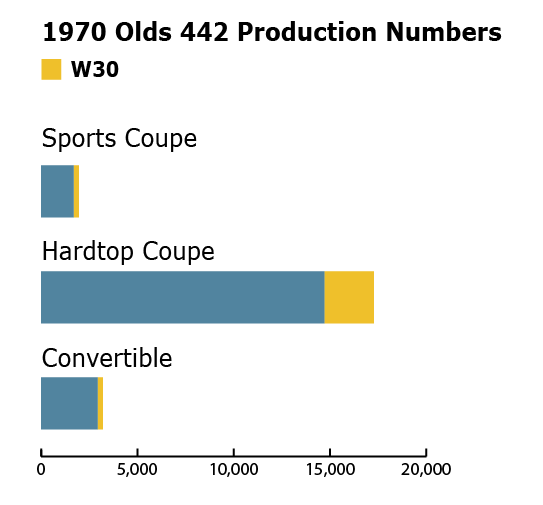 The first two digits indicate the model year, the next three indicate the model. Beware though, as data plates are being made. So it is best to confirm the VIN as well. I’m not one of those guys on television who arrives with a trailer and a pocket full of cash. So I needed a couple of days to gather the funds. I also needed to find someone to help me bring this old cruiser home. Fortunately Joe was extremely cool, and he actually pulled the ad right then and there, with no deposit. I think he was happy to finally find someone who didn’t point out every little defect on the car. I also think he had been beat down well before I arrived. All I had to do was be polite and respectful. I imagine this deal would not have worked out had I been the first one to make an offer. I returned a couple days later with the agreed amount, in cash. I also brought along some tools. It wasn’t a long drive home, but I wasn’t really sure the car could make it. And even though it was currently registered and there was an antique vehicle license plate on the back bumper, it hadn’t been driven in years. So in many senses, it was a true barn find. Joe started it up regularly, thinking this would insure its drivability, so it did run, kind of. Before handing over any cash I did finally get to test drive the old car. Oh man did it run rough! The car hadn’t been tuned up in years. What sounded like an exhaust leak ended up being a broken exhaust manifold. Most likely a result of being warmed up in the winters only to be quickly shut back down. 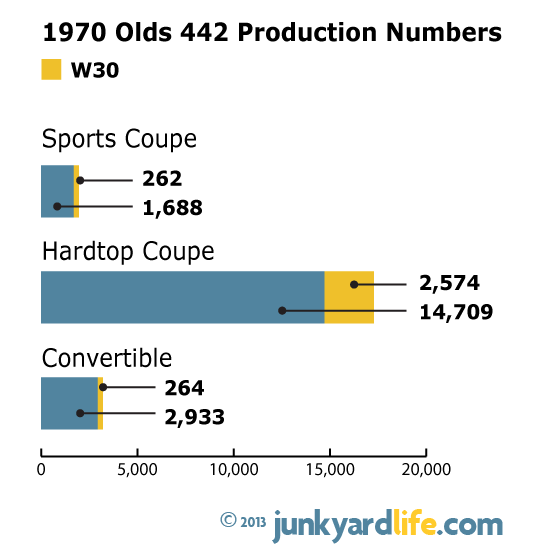 The quick rise and fall in manifold temperatures causes the metal to expand and contract too quickly. The brakes needed work as well. They pulled hard to the right. Another issue was the sagging rear springs and shocks prevented me from being able to safely see over the hood, and I am 6’4. This is not usually a problem for me. Oh well. What do you expect from a car that hasn’t been driven in years? I was lucky that it could be driven at all. The tires look new, but they are so old as to be unsafe for highway use. And since they are mounted 14 inch wheels, finding replacements can be a challenge for those new to the hobby. In the background you can see the shelter that housed 442 and provided it protection from the elements for so many years. When I got the car home I immediately started tearing into the old 442. Trying to figure out what I actually got myself into. I pulled the interior out so I could clean out the mess left by the mice. The rodent urine damaged two of the rear seat belts, which I replaced with some found online. After that, I tore into the rear suspension, replacing the old worn springs and the 70’s era Sears brand air shocks. Now, with the car level, I could finally see over the hood. The exhaust system needed to be replaced as did the broken exhaust manifold. So I sourced a manifold online and had new dual exhaust installed. The Flowmasters sound great and there is no more pesky tapping noise from the broken manifold. I finished the exhaust off by installing a set of reproduction trumpet tailpipe tips. Amazingly, the car cleaned up well and I am not ashamed to drive it to local cruise ins. I plan on using the car, weather permitting, as I acquire all of the parts I will need to restore it. I am attempting to use original parts when available and I am trying not to over-restore the car. Thanks to the Internet, I quickly sourced some really nice original seat belts along with some other small stuff that was missing. I also located a couple of parts cars which I bought, parted out, and sold off. From these parts cars I was able to pull two rust free original fenders, an original Outside Air Intake (OAI) air breather to complete the Ram Air set-up, and an original dash mounted clock. I am still looking for a good trunk lid and a few other parts before I strip the 442 for paint. Eventually I’ll be looking for a 1969 or early 1970 455 to put in the car so as to make it as original as possible. The end goal is to have something more than just a driver while still being able to enjoy it. I don’t want to cringe when my six-year-old boy climbs in, or on it. I want something we both can use and enjoy. And who knows, maybe we’ll make some memories working on it and taking it to car shows. Someday, I hope to pass this car onto him. 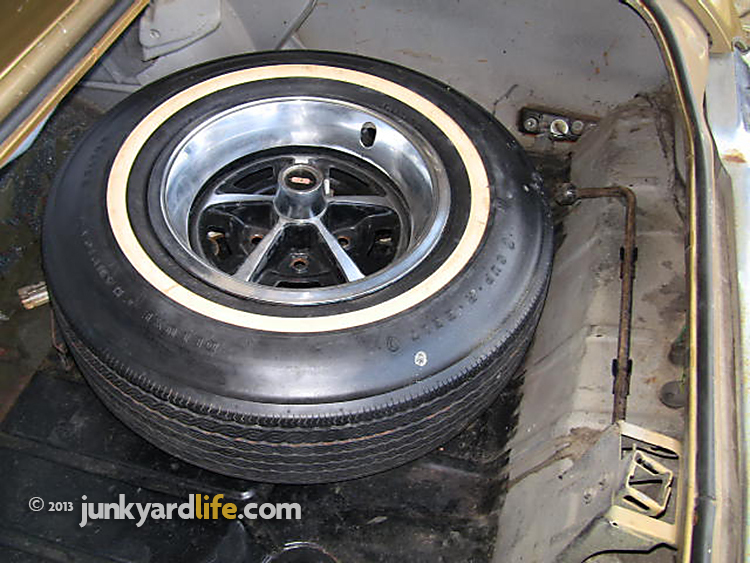 Another element that adds to the cool factor is the original Firestone Wide-Oval spare tire in the 1970 Olds. The jack and lug wrench are also original equipment. The clips holding the lug wrench are reproduction pieces added after I bought the car. This is a picture of the Olds 442 a few weeks after purchase. Many of the bugs have been worked out. But the regular use has caused many more to come out, most notably, the brakes. Which failed completely shortly after putting the car on the road. Fortunately I felt them as they started to give and was able to safely stop the car using the emergency brake. Note to self: always freshen up the brakes before doing anything else. When was the last time you’ve seen a set of these on an old car? The 442 wore Sears brand adjustable air shocks. The cool factor is high with this find, but the ride isn’t. Only 2,933 Olds 442 convertibles were produced for the 1970 model year. Oldsmobile built 19,330 of the 442 models for 1970. The majority of 442s produced were hardtop coupes, with 14,709 built. Convertible fans snapped up 2,933 Olds models wearing 442s badges from the factory. The Sport Coupes were the rarest, with 1,688 built. Sport Coupes can be identified by the post that separates the side glass on the car. 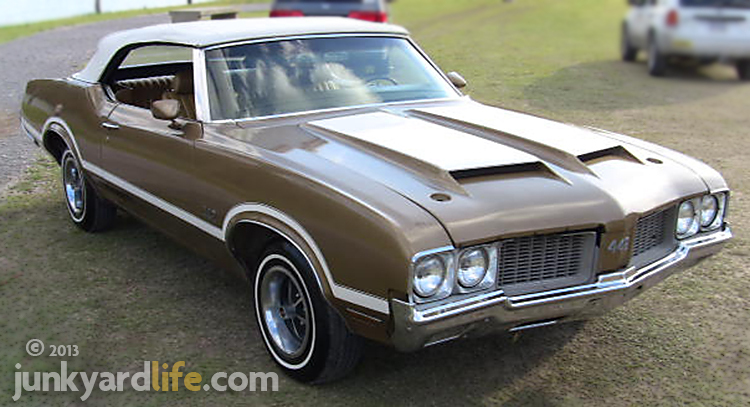 Olds people know that 442s were separate models from the Cutlass in 1970. 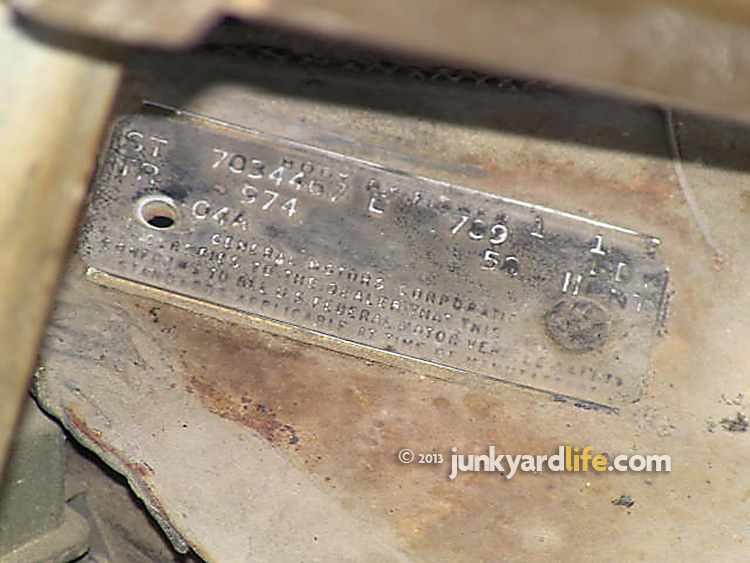 The Cutlass name was not used anywhere on the 442s. 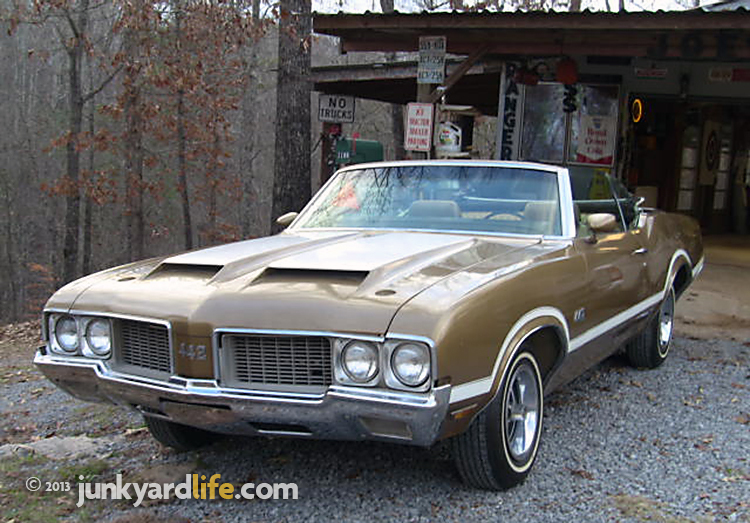 A 1970 Cutlass 442 is a misnomer. Now you know.